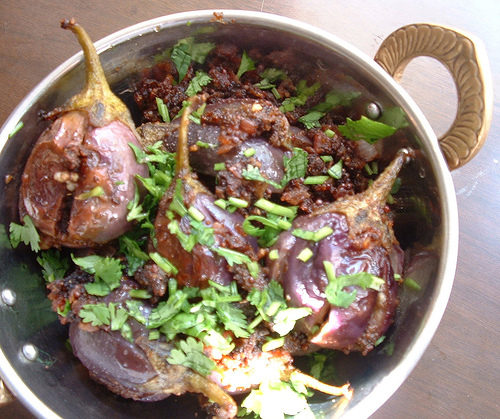 Brinjals (hindi: baigan) are known as aubergines in UK and eggplant in USA. The little brinjals are best for this recipe. Wash Brinjals, slit into four quaters, leaving the stem side intact. Take a bowl ,put lemon juice,add sesame seeds,salt, turmeric, chilly powder, jeera powder,and garlic.Mix into a smooth paste. Stuff this paste into the brinjals. Keep aside. Heat oil in a pot ,add chillies,add mustard seeds, jeera, and methi seeds, let them splutter, lower the stuffed brinjals into a pot,braise for a while ,taking care not to break them. Add chopped tomatoes, reduce and cook slowly with lid closed tightly, till brinjals soft but not mushy. this recipe is seems very yummy.if we mix some grated onion in stuffing,taste will be better.